Sridevi was born in Meenampatti village in Sivakasi on August 13, 1963 to Iyyappan and Rajeshwari. 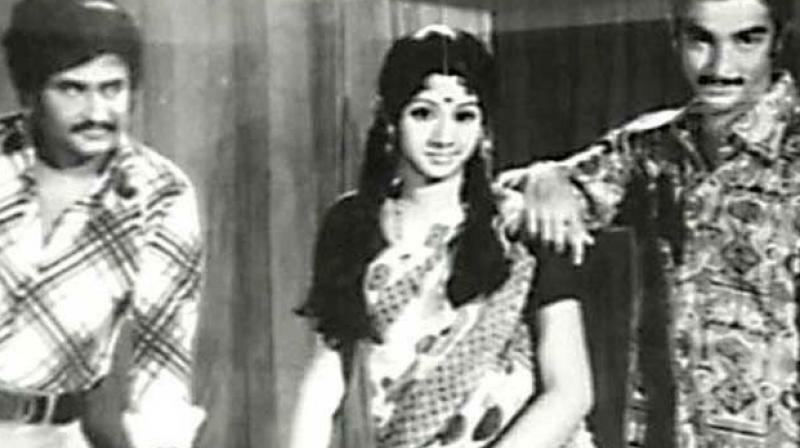 Rajinikanth, Sridevi and Kamal Haasan. The sudden death of iconic actress Sridevi has left the country in shock and grief. Having started her career at the age of 4 in director AP Nagarajan's Kandhan Karunai, Sridevi who entertained the masses for five decades died of cardiac arrest. She was considered the first ‘Lady Superstar’ of Indian cinema, commanding the highest salary and leaving behind a rich legacy of more than 300 films in Tamil, Telugu, Malayalam and Hindi. Sridevi was born in Meenampatti village in Sivakasi on August 13, 1963 to Iyyappan and Rajeshwari. She featured as a child artiste in many films and won Kerala's ‘Best Child Artiste’ award for her performance in the Malayalam film Poompatta. At the age of 13, she became a heroine and ace Balachander introduced her in his black and white film Moondru Mudichu in 1976, where she acted alongside Rajinikanth and Kamal Haasan. The movie was a big hit and it was a big turning point in her career. She was to be paired with Kamal and Rajini in many other films. It was Bharathiraja’s 16 Vayadhinile in 1977 when she shared screen space again with Kamal and Rajini, that catapulted her to dizzy heights. She starred in several quality films like Sigappu Rojakkal, Priya, Johnny, Varumayin Niram Sivappu and Meendum Kokila, but it was in Moondraam Pirai, where she played a woman suffering from amnesia, which won her the first Tamil Nadu state award. She was an inspiration to many actresses and a style icon to many youngsters. The 'Sridevi' brand of pottu (bindi), earrings and bangles were the rage among young college girls in those days. The queen bee who ruled the south industry in 70s and 80s made her Bollywood debut as a lead heroine with the movie Solva Sawan in 1979 and though it did not do well at the box office, her subsequent film Himmatwala, which went on to become a blockbuster, established her in Hindi. Mr India, Chandhini, Chaal Bazz and Nagina were some of the Bollywood films, which put her on a national pedestal. Her untimely death has shocked many in the industry and actors and directors who had worked with her and people who had good rapport with her share their grief and memories with her. Bharathiraja, Rajinikanth and Kamal Haasan left for Mumbai to pay their last respects to the departed soul.